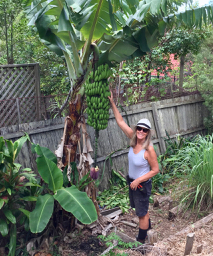 Bananas are one of those really invaluable plants for the backyard gardener – a cornerstone plant loved in many parts of the world for their versatility and nutritional value. At a recent talk in our Community Garden in Mullumbimby ABC gardening presenter Jerry Coleby Williams listed them as a key plant for a sustainable future – along with yams, perennial spinach (like kang-kung and Aztec spinach) and pigeon pea. When choosing any plants for the garden we should be adopting a Permaculture principle (or just plain old common sense!) – does this plant perform more than one function, does it grow easily in your area and is it relatively trouble free? Bananas certainly fit this bill. What would you add to that list of cornerstone plants? I know that I would have papaya, citrus trees, sweet potato, nasturtiums, trombone zucchini, snake beans and lemon grass. This is, in fact, how communities, who don’t have access to supermarkets and industrialized food, exist on staple foods that fulfil for them the above criteria. Let me give you an example. 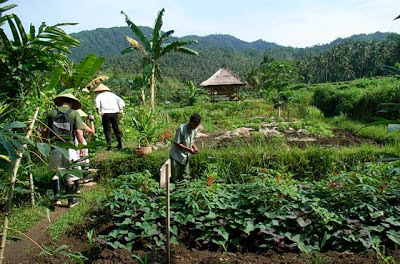 I was working in Bali, helping to design a kitchen garden and cooking school for a hotel in Candi Desa and I was given a list of plants I HAD to include by the head gardener. Most importantly were the three pillars of Balinese life (that’s how he described them) Coconut Palms, Bamboo and Bananas – from this everything else flows; their food, ceremonial offerings, construction materials, utensils, crafts etc. Every family compound will grow them – they also of course grow rice, but not in the compound. Rice is the ‘crown’ that adorns the top of the pillars. Because, with the banana you get the dinner and the dinner service, plus they are packed full of nutritional value, they taste fantastic, are incredibly versatile to cook with and the plants look fabulous. 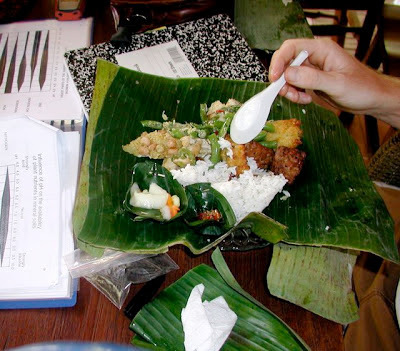 When I was teaching in Bali we used to get lunch for the students my friend Darta’s traditional Balinese restaurant. They would arrive in a basket, each individually wrapped in a banana leaf, pickles and rice separately folded in a little leaf parcel. And……….when we had finished all the scraps could go straight in the compost – everything was biodegradable! When I first went to Indonesia in the 1980’s they didn’t have the plastic/rubbish problems that they have now for everything they served up just like this. One large banana packs over 600mg of POTASSIUM which I eat every day to ward off cramps. They are high in FIBRE and and are abundant in a range of VITAMINS and MINERALS: vitamins A, C – the range of B’s (including B6) and Folic Acid. On the mineral scale Calcium counts in at 9.2 mg, Magnesium 44.1 mg, with trace amounts of iron and zinc. Putting all of the nutritional figures together clearly shows the banana is among the healthiest of fruits. DEPRESSION: According to a recent survey undertaken by the Black Dog Institute in Sydney amongst people suffering from depression, many felt much better after eating a banana. This is because bananas contain tryptophan, a type of protein that the body converts into serotonin – known to make you relax, improve your mood and generally make you feel happier. Beautiful bananas emerging from the flower. 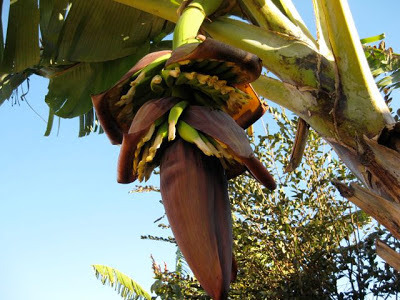 Bananas have been cultivated for so long that they have lost their ability to reproduce by seed – and therein lies the dilemma – because of problems with disease (like bunchy top) it is illegal to give away suckers to friends and neighbours. But, don’t despair banana growers, who are registered to supply suckers, are usually happy to let you have a few – that’s how I got mine. THE BANANA IS A VERY INTERESTING PLANT. The green stems above the ground are, in fact, pseudostems (otherwise known as ‘peepers’ (don’t you love it?)) 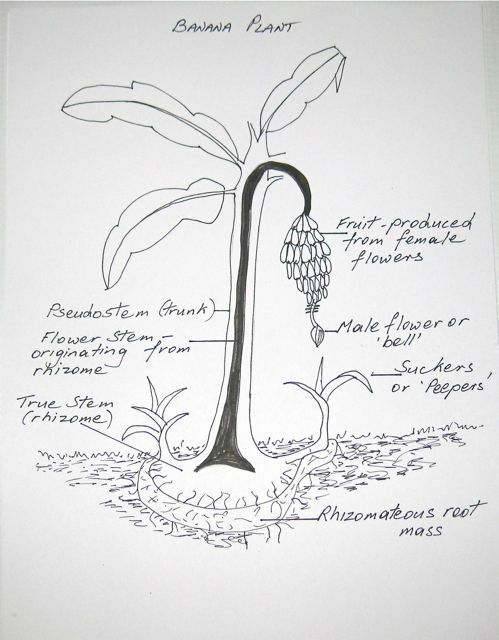 and the true stem is a rhizome under the ground from which all parts of the plant emanate – including the flowers (see above drawing – it’s been raining a lot so I have a lot of time on my hands!) You can now understand why it’s important to feed and mulch around the banana roots? HOW DO THEY FRUIT? The flower stem travels up through a mature pseudostem producing both male and female parts – the bell at the bottom is the male part and the part that produces the fruit are the female flowers at the top. 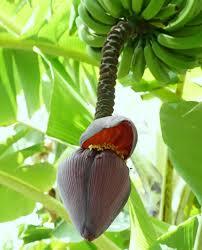 Bananas are unusual in the plant world in that they are parthenocarpic – there is no pollination – hence no seed. Fertilization is stimulated by a phytohormone within the plant. Male bell flower at bottom of flowering stem (this doesn’t produce fruit) with female fruiting body at the top. CARE AND MAINTENANCE Once a stem has fruited it will not produce again so you should remove it. They are very easy to cut down and make a marvellous bio-degradable garden bed edge. A banana plant will keep on producing stems, but you should limit these to THREE per clump otherwise fruit production declines. Bananas are very fast growers and put on a lot of leaf and they therefore require a lot of water – that’s why mulching is important – it prevents them drying out while feeding them at the same time. They respond well to regular watering with compost tea and mulching with comfrey leaves – they like a bit of extra potassium (potash) – otherwise they are pretty care-free. YOU SHOULD GET THREE BUNCHES OF BANANAS per year. If you are not it could mean one of three (or all) things – not enough LIGHT, WATER, or they are in need of a FEED. BATS, RODENTS and BIRDS also love bananas and it may be necessary to cover the developing bunches with a banana bag. WHICH BANANA? The most commonly grown banana is the Cavendish in fact the botanical name for bananas is Musa cavendishii. A popular variety of the Cavendish is the ‘Lady Finger – next is the more stubby sugar banana. 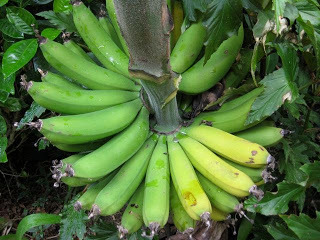 The odd thing is that the Cavendish is a smaller growing plant and more suitable for the home garden than the taller sugar banana. A home grown bunch of Cavendish ‘Lady Finger’ bananas fruiting at hip height – pick as you go? I have already cut off hands from the top once they began to ripen. WHERE CAN YOU GROW THEM? Bananas are typically a plant at home in the tropics and sub-tropics. They are best suited to a warm, frost-free, coastal climate and usually grow well as far south as Perth and Sydney. They need all day sunshine and moisture. WHEN TO CUT THE BUNCH of FRUIT? The bunch should not be left on the on the plant once they begin to colour – you can remove them one hand at a time. The bunch is ready to pick once the bananas fatten out – i.e. they lose their angular shape and ridges – this is usually about four months from the first unsheathing of the bell. If you leave the bunch hanging for too long the fruit tends to split.NOTE: Something that Jerry Coleby Williams was very passionate about were plantain bananas – the kind you use for cooking things like curries and using as a carbohydrate substitute instead of rice, potatoes, and cereals etc. If you’re looking for cornerstone plants for the future he believes that this is just about top of the list. To be continued………. Thanks Rita, Thanks to you I've gone back and clarified that – Lady Finger are a variety of Cavendish. As for the legal thing. 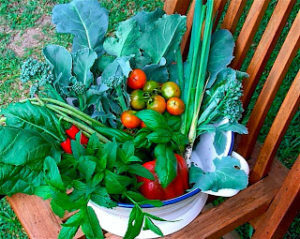 You are allowed to have a few plants in the home garden as long as you get them from a registered source. You will then get to meet the Banana Man – this must be one of the best jobs in the world – its his job to go around checking the health of backyard banana plants. He turns up about once a year, wanders around the backyard, then does the same thing with all the neighbours, then he's off! Great this article on growing bananas. I've often thought I'd like a clump in my garden and have been kept from following up by illegalities in relation to bunchy top. So all I need to do is find a friendly licensed banana grower? In the vege shops Cavendish and lady fingers are two distinct varieties. To my taste, too. My cornerstone plants are the feral tom thumb tomatoes, no other tomato will grow for me. Self seeding lettuce. Chives.